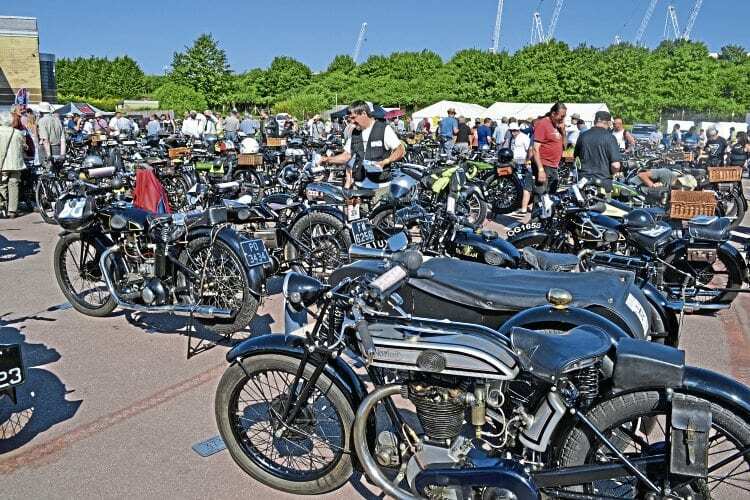 The Vintage Motor Cycle Club’s sweltering 69th Banbury Run of Sunday, June 18, took place only four days before the last issue of Old Bike Mart went to press, enabling us to bring you just a short report and photo selection, so here we follow it up with the full list of results from the day. Overview of the sun-bathed Gaydon arena. John Wickes’ 1928 Norton Model 18, a 490cc OHV single, is to the fore. Bill Moore Trophy (rider nearest allotted time schedule at one or more checks, and having gained a gold award), Mary and Huw Adams (BSA S29); Len Wills Trophy (best performance on a veteran machine), Geoff Wheeler (1903 Quadrant Banking Tricycle); Vintage Tyre Scheme Trophy (best performance on an early vintage machine), Keith Sams (ABC Sopwith); Ken Cobbing Trophy (best performance on a late vintage machine), Keith Waring (Triumph N); Joe Tite Memorial Trophy (youngest male entrant gaining a gold award), Chris Last (New Hudson Semi-Sports 90); Timothy Smith Memorial Trophy (best performance on a veteran Triumph), Bill Mantle; Wootton Trophy (overseas entrant achieving best performance), Ian David Slade (Ariel B); Newcomer’s Trophy (first-time entrant with best timed performance), John Cummings (Bradbury). Susan Moore Memorial Trophy (youngest rider finishing course and riding in first Banbury Run), James Adams (Triumph P); Ivor Mutton Founder’s Award (entrant or Royal Enfield in best condition), Graham Nye (1926 Model 201); Banbury Town Mayor Trophy (best dressed entrant in period attire in keeping with machine), Julian Wade (1914 BSA); Drayton School Trophy (entrant of oldest machine to finish course), James Belcher (Royal Ruby); Miniature Cup (presented by Stan Greenway to entrant of best machine not exceeding 200cc/1¾ hp), Bernard Blackwell (1913 JES Motorcyclette); Class A Tankard (best in Class A), Richard Woodcock (1913 Rex Deluxe Twin); Class B Tankard (best in Class B), W ‘Ken’ Lay (1918 Triumph Junior); Class C Tankard (best in Class C), Barrie Colman (1930 Douglas H3); Best sidecar tankard, Alan Yeomans (1930 BSA Sloper outfit). Full results and more photos in the August issue of OBM – available now! Next Post:Roaring Twenties in more ways than one!